Actor, director, writer. Born July 6, 1946, in New York City. A one-time beauty school student, Stallone discovered a passion for acting while studying on scholarship at the American College in Switzerland. He returned to the United States and studied drama at the University of Miami, dropping out before graduation to move back to New York and pursue an acting and screenwriting career. His first substantial role was in The Lords of Flatbush (1974), after which he moved to Hollywood. 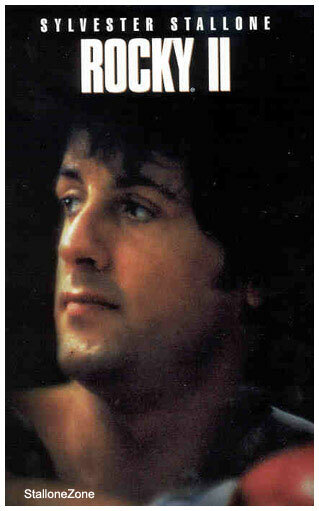 Stallone reportedly wrote the screenplay to Rocky (1976), the film that would make him a star, in just three days. Rocky won Academy Awards for Best Picture and Best Director (John G. Avildsen), and Stallone was nominated for Best Actor and Best Original Screenplay. With the success of Rocky and its sequels (1979, 1982, 1985, and 1990), which he also directed, and the three Rambo movies in 1982, 1985, and 1988, Stallone was firmly established as an action-film hero. While Stallone's attempts to break into comedy in films such as Oscar (1991) and Stop! Or My Mom Will Shoot (1992) have largely failed to gain an audience among fans or critics, he scored action hits with Cliffhanger (1993) and Demolition Man (1993). More recently, he had less success with The Specialist (1994), Judge Dredd (1995), Assassins (1995), but earned critical buzz for his performance in the low-budget police drama Cop Land (1997). Following a two-year hiatus from film work, Stallone re-emerged in 2000 with a title role in the gangster movie Get Carter a re-make of the 1971 thriller starring Michael Caine. His most recent projects included the psychological thriller Eye See You and Driven (both 2001), which paired him with Burt Reynolds. As part of an ensemble that includes, Madeline Stowe, Anthony Quinn, and Andy Garcia, Stallone is currently filming the action feature Avenging Angelo. Stallone has two sons from his first marriage, which ended in divorce after 11 years. He was briefly married to the Danish actress Brigitte Nielsen, but since 1997 has been married to his third wife, former model Jennifer Flavin, with whom he has two daughters. Besides the tabloid headlines trumpeting the happenings in his personal life, Stallone earned unwelcome press coverage in late 1999 with the announcement of the bankruptcy of Planet Hollywood, the high-profile restaurant chain he co-owns with a group of Hollywood stars including Bruce Willis and Arnold Schwarzenegger (who has since withdrawn from the venture). Patrick Stoner: So, a kinder, gentler you, eh? Sylvester Stallone: Yeah, well, it was time for something different, you know. Hey, I'm getting old. Stoner: We're the same age, so I know what you're saying, but I see no sign of it yet in you. You're hiding it well. Stallone: Ah, you're just being kind in the face of my decreptitude. No, I just thought it was time to play someone who wasn't trying to be in charge all the time -- someone who knew what he was doing but had been humbled by life experiences -- not a superhero. It's time for me to start playing people closer to reality, without lo sing my audience. Stoner: What's motivating the difference, besides age? Stallone: My personal life -- family problems, health problems. You know about them. I won't bore you with them. But you know what happens when you get famous and wealthy? You get cut off from reality. There are always people standing between you and reality -- taking care of things for you, moving problems out of your way, making sure you're comfortable and happy and feel safe. Then, you have some tragedy in your family, and you realize that no amount of fame or wealth can protect you from the same dangers that everyone else faces. THAT's a reality check. Big-time. Stoner: It must make you think back to the beginning, just before the fame, in South Philly making ROCKY. Stallone: I'll tell you, that was a time. You know that run through the streets of South Philly? It wasn't planned. We didn't have any money or any pull. I just jumped off of the back of a truck and started running, past stores and street people, everything -- nothing planned. Everything you see -- the smiles, the waves, the greet ings, the warmth -- it was all real. South Philly made me. I love the people there. I always will ... 'til the day I die. "I take rejection as someone blowing a bugle in my ear to wake me up!" SYLVESTER STALLONE is right on track in his fierce new movie 'Driven'! How does he feel behind the wheel? Get his story here! ENTERTAINMENT TONIGHT: Tell us what this movie is about. SYLVESTER STALLONE: 'Driven' is the title, and it's the story of these men that live the hyper-accelerated lifestyle of a racecar driver. Men constantly have to prove themselves; they have to do things to make them feel like men. As you get older those options diminish, and you start to feel less and less important. This movie is also about the women in the racers' lives, and how important that is to keep things stable. Unless your life is together off the track you really can't come together on the track. It's really about balancing all the balls of life at one time. It's a pretty complex film. ET: Why do you say this is a very important film for you? SYLVESTER: It's certainly the most ambitious -- it was very difficult to mount because it's quite hard to sell this concept. People just think, "It's just a racecar film." But it's similar to how 'Rocky' wasn't a boxing film, and 'First Blood' wasn't really a war movie. We're really trying to deal with the psychological collateral damage and the amount of pressure that people deal with. It's about every man and woman's life, but it's hyper-intensified. SYLVESTER: The world of this film is the kind of world where you say, "Good morning, honey, I hope to see you tonight -- alive!" These people are like astronauts that go up every day, instead of once every three years. ET: How did you become interested in this whole world of racing? SYLVESTER: I got into it maybe five or six years ago. I realized that these guys were incredibly focused and knowledgeable, not greasy guys with wrenches in their back pockets. There are millions of dollars wrapped up in the racing scene. It reminds me of that film 'Rollerball,' where corporations ruled the world. Nothing has really changed since 'Ben-Hur' and ancient Rome, this is just like the chariots going around the track. Then I thought, "Why has racing been so important, since the dawn of time?" I think there is something very subconscious about the act of racing. In one sense it can symbolize the race of life. We're all in some form of a race, in one form or another. I thought, "If I could show that symbolism in this film, that would be great!" ET: Does that symbolism hold for you? Is this film a personal race for you? SYLVESTER: Absolutely! Everything is a race for me. We're always fighting time and rejection. There are two ways to take rejection. I take rejection as someone blowing a bugle in my ear to wake me up and get going, rather than to retreat. So I definitely look at this as a very ambitious project that gives me the opportunity to work with some talented young actors. They bring about a certain naivete and enthusiasm that is very refreshing. It helps me blossom a little bit. Working with BURT REYNOLDS, who is a legend, was great! It's great to work with someone that I've had a 25-year relationship with, he's really a man's man. ET: How did you learn how to drive these cars? SYLVESTER: How do you know I did? (laughs) I went out to Derrick Daley's course in Las Vegas. We started on Formula Fords, then Formula Atlantics, where we got up to 185 miles per hour! I don't know if I'm really gifted enough to be doing that! After spinning out about 30 times, I began to understand the true craft of these guys! These people ride on what is known as the "ragged edge." Imagine running as fast as you can across ice and trying not to fall down. That's just what these drivers are dealing with! The trick is seeing how long you can keep that adhesion to the road. Part of the message of this film is that you really don't know who you are until you've been confronted with tremendous adversity. Then you can understand what you are made of. ET: Is the role challenging for you? SYLVESTER: Yes, it's very challenging because I am playing a man who is coming back for a second chance, but I'm not brought back here for a second chance. I'm brought back here as an example of how never to be, how it is to be a born loser who squandered every bit of opportunity. It's my job to help this young driver become everything that I could have been. I do this by taking him through all of the minefields that I stepped on. It's very difficult for me to bury my ego and my ambitions and realize that I am going to live through someone else. It's almost like a father-son relationship. It's also realizing that the generations must move on and the best thing you can do is help the next generation avoid all the mistakes that you made. It's important not to be bitter about it; it's all about give and take. ET: Do you see any parallels between this film and your own life? SYLVESTER: Very much so! I think you really only write well about what you understand. 'Rocky' was very symbolic, and it was easy for me to write because I really felt it. It's the same with this; there are many aspects of this film that are autobiographical. ET: So what do you get a chance to live out through this role? SYLVESTER: The beauty of film is that you get to rewrite your history a little bit, even though you know that it is not really going to happen. It would be great to be able to pass on to someone all of the successes, the failures and the knowledge that one has had. To help someone avoid all the fire, pain and anxiety would be wonderful. But one thing with youth is that they have to do it themselves, so it is like a constant battle. This is really a story about redemption. I'm playing a character who is past his prime and I think that many people can relate to that. Many people feel frustration at being cast aside because you turn a certain age. ET: Has that happened to you? SYLVESTER: Yes it has. That is one of the reasons that I have been lucky. I have been fighting so hard against that! The key to my success has been relate-ability. I think that is every performer's success -- they have to be able to relate. ET: I heard that it was difficult for you to get this film together. Is that true? SYLVESTER: Well, only because this film was incredibly ambitious. Racecar films have never been fully realized. They've never been box-office mega-runaways. So there has always been reservations toward them, just like boxing films. The reason why I like this film so much is that racing is so symbolic of life, how we're all involved in our own race. Sylvester Stallone became one of the world's biggest stars by playing icons who demolished whatever stood in their way. But when his daughter was born three months ago with a hole in her heart, love and faith were the only forces he could marshal. It was a new approach for the man who put the punch in Rocky and the fight in Rambo, and it seems to have worked. Sophia Rose, whose mother is Stallone's off-and-on girlfriend of many years, model Jennifer Flavin, looks like she'll be fine. Now, Stallone is hoping a little love and faith can breathe new life into his film career, which has been weakened by too many brainless action movies. The new Daylight, a Poseidon Adventure-style disaster epic set in a collapsing New York traffic tunnel, will be his last action picture--at least for quite some time. He plans a return to the character-based values that made him an overnight sensation 20 years ago. Stallone recently completed Copland for Miramax, a heavy-duty drama costarring Robert De Niro that's due next summer, and he's set to appear in An Alan Smithee Film, a Hollywood satire written by Joe Eszterhas. If Stallone can translate his sharp insights and witty real-life conversations onto celluloid, he may never play a mushmouthed action figure again. He has, after all, overcome a troubled childhood (complete with speech defect), been educated in Switzerland, written and directed blockbusters and even garnered some critical acclaim for his painting. In other words, Sly's no dummy, he just plays one in the movies. And, sometimes, in the tabloids. But at the age of 50, Stallone says he's done making dumb personal and professional moves. A tiny infant's heart, it appears, has the power to tame even the mightiest movie gladiator. Movies, schmovies. How's the baby? She had full open-heart surgery, and she recovered in remarkable time. Now, she's with her mother, and I'm lovin' it. It must have been nightmarish there for a while, though. I thought we should wait a couple of months for the operation, but she was choking and gagging, and Jennifer said, "We cannot wait--we can't think that a miracle is going to close this heart." You have two sons from your first marriage, one of whom is autistic, so you've had some experience with parental trauma. But Sophia Rose is Jennifer's first child. She showed extraordinary strength. In the hospital, she literally shook for three days. I've never seen that kind of love or dedication or the [sighs]...foreboding sense of loss, if things had gone wrong. I feel as though, after nine years of ups and downs, I've really seen the gold she's made out of. It must have been terribly frustrating for you, too. After all, you're the epitome of the self-made man. You've taken control of everything in your life, from your physique to your career. But you couldn't control this. Every human being has this outlook that we think we're in charge, and just when we start to get ahead, reality comes crashing down and we realize we're not as in charge as we think. The situation with my daughter really brought that into focus. With all the money, all the notoriety, I was completely helpless. I was in the hands of another man--a surgeon who became God's coworker for a time. You've said that your life has been extraordinary, but you wish you had been there to enjoy it. Now that you're accepting the fact that wealth and fame and control aren't everything, are you better able to appreciate life? When you reach a certain age--especially at 50, for a man--this is the crossroads time. This is the last call--"All Aboard!" --to get off this train and switch to another one. I am appreciating life much more now. Fifteen years ago, life to me was, "More is better, variety is the spice" and so on and so forth. But if you continue that way, you never find anything that is solid, that will eventually endure. I feel very good about giving that up. It's debilitating, it's draining. And I think if you really want to be quite good, it takes a little bit of abstinence, holding a piece of your soul in reserve. If you're going out every night, before you know it, the reservoir is empty. That sounds like settling-down talk. We're gonna get married. Probably right after Christmas, when the baby heals and everything. There was one stunt in the movie where I had to crawl across a beam into a waterfall and plug it up. The water was freezing, and the way it was designed, I couldn't get my arm in there, and I was slipping. So, I had to do this one-armed thing and pull myself up. I wasn't trying to be a show-off, but there was nothing to grab onto. It was a very weird situation. So, I'm doing this, and I looked down, and all of the safety mats had been washed away! I'm looking at a 30-foot drop onto concrete and twisted metal, and I'm freaking out because there's no wire. I hate wires because, a lot of times, I get tangled up in them. That was a very bad situation. And the type of thing you've put yourself through enough in your career. Are we, as Danny Glover might say in a Lethal Weapon movie, getting too old for this? I'm still interested in "hands-on" action movies. I mean, I would love to do something like The Fugitive or Lawrence of Arabia. That's great stuff. But wouldn't it be great to do the old kind of action movie that also had drama in it? Like Clint Eastwood. Maybe every third film or so, you just do something that maybe won't make a dime--and you don't take a dime. But you do it so you can sit back there at the end of your life and go, "I tried to make some kind of fruitful contribution. I just wasn't in it as, quote, a revenue-earning machine." That's what I'm trying to accomplish. Like with Copland, which you did for peanuts to be able to work with the likes of De Niro and Harvey Keitel. Must have been quite a change for a guy whose movie dialogue usually consists of variations on the phrase "Yo!" I knew going in that it was going to be similar to F.I.S.T. or the original Rocky, so I prepared for a month. I think you'd call it a self-hypnosis; you start to develop a certain kind of concentration. I prepared and prepared and prepared, so when I got to the set I felt comfortable with the dialogue. But I didn't quite know how I'd make it fit. Quite often, in the films I've made over the last 15 years, the dialogue was very confrontational, sometimes loud. I relied too much on volume, rather than the eyes and body. When in doubt, shout--y'know? So, it was great working with Bobby and these guys and learning to be a little more conservative, playing the beats and the moves. It wasn't all bang-bang. There was a sense of relaxation that I learned, and I liked it. But I tell ya, there was a lot of testosterone on that set. Ray Liotta, Robert Patrick, Michael Rapaport, I mean, they were like these real cops. But you, against all hormonal expectations, play the out-of-shape donut eater of the bunch. I went up to a 391/2-inch waist from a 301/2. And it really hurt--really stretched me out. You've been watching too many De Niro movies. Which, by the way, your hard-action fans will be alarmed to learn you prefer over some of your own greatest hits. I came in during the '70s, and I loved the films back then. Correct me if I'm wrong, but I thought those were the best films ever. Then what happened? The film industry started to go through an amazing transition from the inception of Star Wars. That was the beginning of film as machinery, and you can see where we've come. It finally caught up to what I do, but I just feel as though it's not what I do best. Well, speaking of what you did do best, this is the 20th anniversary of your most acclaimed work. Did you ever imagine your simple little come-from-behind story would endure as one of the great myths of the century? No. Rocky turned out to be kind of a metaphor for everyone's struggle. It wasn't about me, Sylvester Stallone, and money. It was just about wanting to fail on your own terms. It was about wanting a chance at failure; Rocky never thought he'd succeed. But like him, I just wanted to try. Little did I know that, 20 years later, that philosophy would end up being respected. But that hasn't made you sleep any better at night. You know, I have not slept well since Rocky came out. Sometimes, when I'm in L.A. and Jennifer's on the East Coast going on the Home Shopping Channel at 7 in the morning, I'll call her at 3:30 West Coast time. She'll say, "Why aren't you in bed?" and I'll say "Bed? I've been awake for hours." Do you still paint when you can't get to sleep? I haven't done as much as I want to. I have to build a studio somewhere. I usually paint in the garage, but Jennifer hates it because the cars get covered and look like something out of Tangerine Dream. What I do with what I paint now is put them on shirts for charity at the Planet Hollywoods. Last year, we raised $750,000 for autism, and this year we might get about $2 million. This way is good, because I would feel somewhat tawdry selling my paintings. They're fun, they're therapeutic, but I really don't think of myself as a true starving painter, and I would feel kind of bad encroaching on their turf. They could say, "Don't you have enough, Sylvester? Can't we have something to ourselves?" 25 years ago Sylvester Stallone became a superstar and something of a hero with Rocky. A quarter of a century on, a fit and youthful Stallone is back in the driver's seat - literally and figuratively - in the Renny Harlin-directed race car movie, Driven. 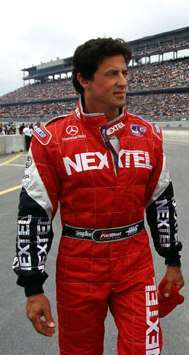 Based on the CART open-wheel racing circuit, Stallone plays a semi-retired driver who agrees to coach a young racing prodigy in turn pitted against a champion driver. Stallone is both star and producer of the film, which took him four years to get off the ground. It was appropriate, then, that Paul Fischer met with Stallone at the Toyota race trials in Long Beach, California, with the sounds of engines humming loudly in the background. 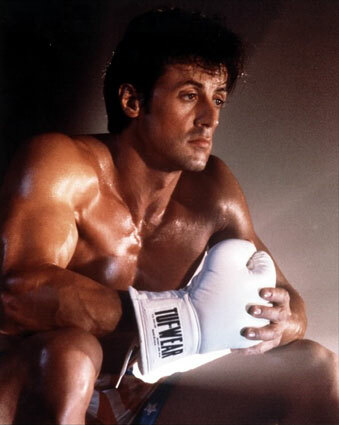 CrankyCritic: 25 years after Rocky, what parallels would you draw between your character in Driven and Rocky Balboa? Sylvester Stallone: Only in that he's unfulfilled in a sense, as he says in the beginning, he's will over skill, he has a lot of incentive and a lot of heart and he feels for people. CrankyCritic: Did you recognize any of Rocky when you were writing this script or are you simply attracted to characters like these guys? 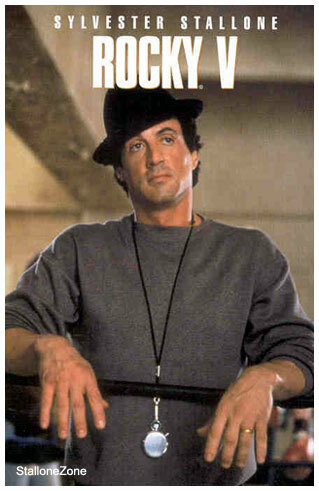 Sylvester Stallone: Very much so. Initially the character was much darker and much more controversial in the sense I took a compilation of characters that had blown their careers, had been accident-prone, had become drunkards, very, very drivers that had blown their careers at the height, and he's brought back originally as an example of how drivers should never be. That's why Burt Reynolds brings him back because Kit Pardue's character is going off the deep end, the champ can't deal with his responsibilities, fear is setting in, and he's basically setting up his own failure syndrome. I found that people literally sabotage themselves, and the young driver was sabotaging himself; he's finding ways to fail so he doesn't have to deal with the pressure. Then I'm brought back there as a man who did the same thing, so I am supposed to be his mentor, and guide him through this minefield from all the mistakes I've made. That character was extremely in the forefront, almost a one-man show with the rest of these characters sort of in the background and I didn't think that was the way to go, so that was reduced to the point where it became more of an ensemble. CrankyCritic: Both Rocky and Driven were written at specific times in your life. Do both films reflect where you are at those points in time? 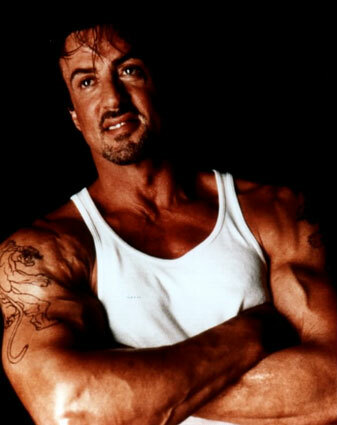 Sylvester Stallone: Yeah, I think so. I think there's a more contemplative aspect to it all and you become more philosophical and towering, and not so self-serving. I think if you start to will and project things, stuff could happen. I mean I think you have to be part of your own architect and you have to have the responsibility and discipline to be happy, but at the same time to be supportive of other people, because I think that's all part of one's success to have people also give you their love and endorsement. So that's what I tried to do in this film. He is more of a big brother to these guys and he says to the young driver: As soon as you can take care of yourself off the track, you'll be able to take care of yourself on the track. And that's my philosophy of life, the same with acting. Until you get your private life in order, you can't keep your professional life in order, it just won't work. Sylvester Stallone: That's almost a movie in itself. It's four years of almost back-to-basics; it's almost like starting out as an unknown, because you're dealing with a project that a lot of people are wary of, racing. There have been racing movies in the past, but they haven't performed as well as say, football movies, so there's a little hesitancy. So we had to start from scratch. In this day and age you can imagine how expensive it is for a racecar film to be, so to put the whole thing together and do it within a very frugal budget, is pretty impossible. CrankyCritic: So was it a humbling experience shopping this around? Sylvester Stallone: Oh yeah, it is very humbling and I think puts your life and soul in perspective, in that: This is how you started and some things that are hard fought are the ones you take great satisfaction in, unlike the ones you come too easy, like the guys who inherit $100m and end up like junkies jumping off a building. If it all came too easy, they feel unfulfilled because they haven't accomplished anything. So I think with all these hard-fought wars, you just don't quit. CrankyCritic: What was it about it that made you carry it for so long? Sylvester Stallone: I like films that deal with two stories at the same time. In other words, you have boxing with Rocky, but it's really not about boxing and it's not so much about Rocky. It's about a feeling, a kind of spirit and a dignity thing. Racing is not just about cars going on a track, it's about dealing with your own fear about dealing with the competition, and how life is a constant race; you win some, you lose some, it's about keeping your eye on that finishing line the whole time. It's a metaphor, because what we do every day is race - we race from the moment we get up, race to get here, race to get the interview, race back for your deadline, right? Why do people race? They do it all day long from the moment they're born. CrankyCritic: You still look incredibly young and fit. How do you keep in shape? Sylvester Stallone: After Cop Land, I had a bit of time on my hands, so I went back and exercised and basically changed the diet and messed around with different herbs to see what would happen, almost like a hobby. But it's a tough hobby. I'd much rather be like I was in Cop Land. CrankyCritic: Going back to Rocky. The entire series is about to be released on DVD. What input did you have on all of that? Sylvester Stallone: I had to sit through my movies, which is not easy sometimes, and narrate the whole lot of them. CrankyCritic: And you remembered it all? Sylvester Stallone: It's unreal how burned into my brain it all is. You don't remember the off-screen stuff, the hi-jinks, especially if you're also directing them. But man, you remember that punch and who broke that jaw and being in the hospital for 10 days here sand there; all that kind of stuff. CrankyCritic: Why has that character sustained for all these years? Sylvester Stallone: Because it's an ideology, I think, rather than just a character performance. We take boxing liberties. Nobody can take those kinds of beatings, but again it's a mythological character. That's why we started the whole thing with the face of Christ and he comes down. It's a parable. You can take a guy who's downtrodden or whatever but there's a spark of desire to want to rise or fail but he will never get that opportunity. Rocky is about an opportunity to rise or fail; that's it. When I was spending years on the streets, I would relate and so when I wrote that, that was basically my story; this one chance. The most important scenes in all the Rockies - and this is my philosophy - I know I'm going to lose, but I just want to be standing at he end, so I'm not another bum from the neighborhood. I'm not as good, not as smart, not as gifted, but I have perseverance. And I think people can relate to that.